My favorite ( by far ) painting boxes are made by Alla Prima pochade. They are hand made by artist Ben Haggett, and they are truly masterpieces of great woodworking skill. I have been using mine for years and the more it gets used, the more i love it. What I love most about it, is that each one is unique, since the wood grain will never be the same on each box. The fact that they are made of high quality woods and by hand ( not mass produced in a factory ) was a huge deciding factor for me when choosing my ideal painting box. I will always support top quality craftsmanship over assembly line stuff. "Pochade" is a French word for a small sketch, especially one executed in oils, out of doors. 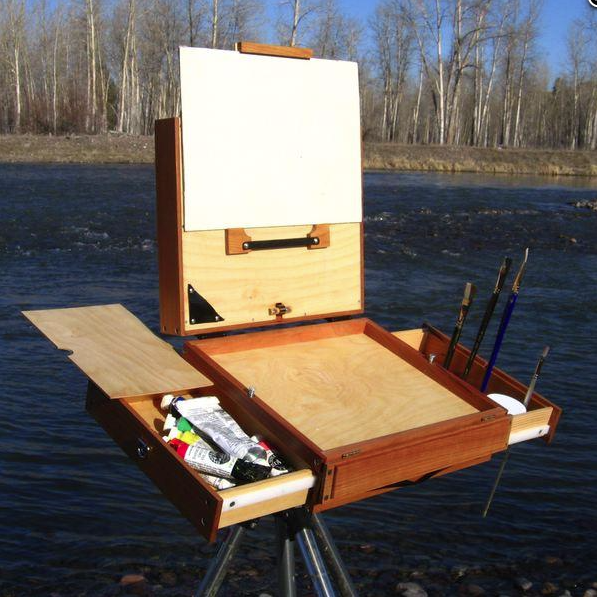 A pochade box is a lightweight, portable painting box, with an incorporated panel holder that acts as an easel. Modern ones feature tripod mounts for easy positioning. Pochade boxes have become the preferred platform for creating small plein air paintings. As a plein air painter and woodworker, I've been building and enjoying my own pochade boxes for years, while always thinking about how to make them better. Now I've designed a line of pochade boxes that incorporate all the features that I've always wanted. Features like the ability to carry four wet panels of different sizes, a lid that holds position without annoying braces and wingnuts, and the convenience of having paint tubes, water or turps containers, and brushes accessible while I paint. Of course, I use quality woods and stainless steel fasteners, because I believe tools should be durable as well as beautiful. My philosophy is simple: the more you enjoy using your equipment, the more you will paint and create. Art is long, and life is short, so get the tools you need, and go...paint! You can buy them here and you can watch videos of Ben's whole range of pochade boxes here. I have been using and recommending Rosemary & co. brushes since 2012 and have never looked back. I believe there are no better hand made brushes in the market. I know that is a tall claim, so what I ask of you is to go here and get some, try them and let me know your verdict. I am sure they will surpass any of your expectations as it did mine. I also recommend that you try different types of Rosemary & co. brushes and do not limit yourself to my choices. There is a perfect fit brush for you and they have an incredible variety of brushes available to all types of artists. Interlocked bristle brushes offer the artist a traditional brush but with double the interlock. Two equal amounts of best quality Chinese bristle set opposite each other so that the natural curve is facing inwards .The bristle is selected in length and size to enable perfect balance. Although labour intensive this gives the artist a hard wearing brush which keeps its shape for a very long time. Easy to clean and a good performer. The Ivory is synthetic bristle at its best, a cross between the feel of nylon and hog bristle. The longer hair results in a loose brush with little "snap". There is no water within the Artisan formulation; the linseed and safflower oils have been modified to allow the colour to accept water. This creates a stable emulsion, and retains the working characteristics of conventional oil colour. The pigments, together with the most suitable oil, bring out each colour’s individual characteristics, from opacity to natural transparency. Artisan does not require hazardous solvents. Unlike traditional oils, this range can be thinned and cleaned up with water, and all brushes and equipment can be cleaned up with soap and water. With a balanced spectrum of 40 colours, Artisan includes 25 single pigment colours for colour brilliance and clean colour mixing. Since it does not need hazardous solvents, Artisan is ideal for artists painting outdoors, or for those who share a work space, also for those in education or at home, those looking for a safer painting environment, and for travel. With a buttery, thick consistency, a broad variety of techniques can be achieved and the colour can be thinned as required. Each pigment needs different levels of oil in the formulation, so the sheen may differ slightly from colour to colour. Artisan has its own range of thinners, oils, mediums and varnishes to allow all oil painting techniques. Created specifically for Artisan these ensure the best performance and a painting experience very close to traditional oils. Professional Acrylic is our finest quality acrylic range. It combines our colour making expertise with the latest developments in resin technology. Our 80 colours are brilliant when wet and remain as bright when dry. What you see is really what you get. Most acrylic paints darken in tone as they dry. This affects colour richness, intensity and depth and makes colour matching difficult. With our new unique binder, translucent when wet and drying clear, there is virtually no colour shift at all. This makes it easier to match Professional Acrylic colours from palette to canvas, and delivers superb colour brilliance every time. With 62 single pigment colours, this creates the cleanest, brightest spectrum, and the best colour mixing opportunities. Acrylics dry quickly, which allows you to over paint within minutes and build up multiple layers during one painting session. For some artists acrylics can dry a little too quickly, so we have formulated the range to have a longer working time on the palette without compromising the drying time. Depending on the thickness of the paint, the working time is approximately 20-30 minutes. Our Professional Acrylic range offers a smooth, thick, buttery consistency with no stringiness. The colour blends easily, can be mixed with mediums and thinned with water for water colour techniques. It also retains brushstrokes for excellent impasto effects. Professional Acrylic gives a generally even satin finish. Unlike other ranges, the colours do not contain extenders to modify the gloss.